Jamie Whincup has sent an emphatic message to his competitors in the first race of the 2016 V8 Supercars season at the Clipsal 500 Adelaide. Starting from second on the grid, the six-time champion grabbed pole man Scott Pye of the start and didn’t waver as he cruised to victory. 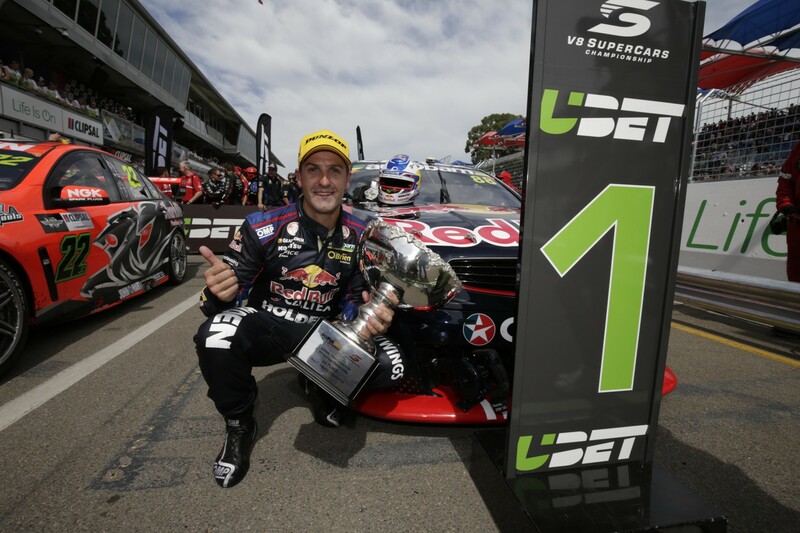 It’s the third consecutive year Whincup has won the opening race in Adelaide, and the ninth year in a row Triple Eight has won the year’s first race. It is the 98th win of Whincup's career and his 10th race win at the Clipsal 500. Whincup will start from second place again for this afternoon’s second 125km race at the treacherous street track as temperatures soared into the 30s. Red Bull’s Whincup led Holden Racing Team’s James Courtney by four seconds after the Holden Racing team devised a clever pit stop strategy to elevate him to second after starting fifth. Whincup’s new teammate Shane van Gisbergen came home third ahead of Volvo’s Scott McLaughlin and HRT’s Garth Tander in conditions that saw temperatures reaching around 52 degrees celcius in the cabins. “It’s pretty warm out there – we’re bringing 88 back this year so nice to get the runs on the board early,” Whincup said. Courtney said race two will be physically challenging this afternoon. “Great way to start the year, congrats to the other blokes and bring on this afternoon. It’s a scorcher, it’s so hot in there it’s going to be hard to back up this afternoon,” he said. As Whincup pounced off the start line, there was drama down the back with Lee Holdsworth turned around and falling back through the field. Teams started stopping for tyres at the earliest possible window with Craig Lowndes and Chaz Mostert electing to take rears only early on. It was during the pit stop Pye lost out, with dramas on the left rear. The Safety Car made an appearance shortly after for Tim Slade, who locked his left front tyre into turn nine and ran up the escape road. He was unable to find reverse and after a heated exchange with officials his car was loaded onto the trailer and his race was over. The race ran green for the remainder and Whincup built his lead over Courtney. Milestone man Craig Lowndes cam home seventh, with champion Mark Winterbottom right behind in eighth. Those two start alongside one another in today’s second race on hard tyres this afternoon. The V8 Supercars line up for the day’s second race at 4.15pm local time.